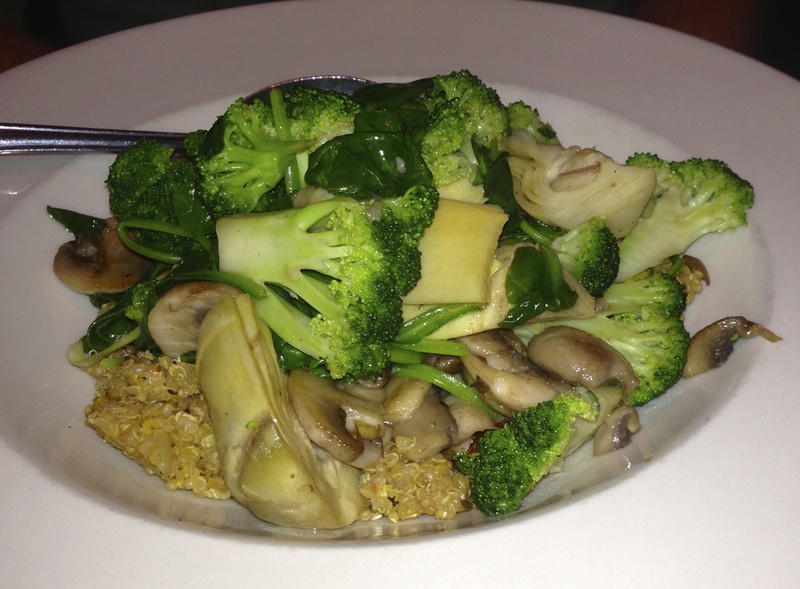 Date Night will admit it–occasionally we eat tofu, both at home and when we are eating out. The tofu burritos at Willy’s are excellent, but the people who take our order always look at us funny when we order them. Tonight, we go to a restaurant that doesn’t laugh when you order anything vegan or vegetarian, because that’s all that’s on the menu. 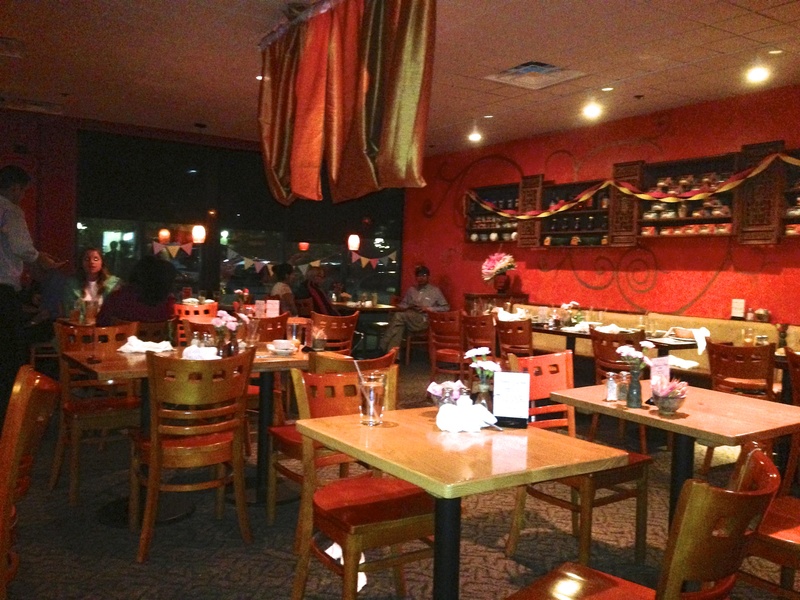 We are at the Sandy Springs location of Cafe Sunflower. They have two locations, one here and one near Lenox. The one near Lenox has something that this location does not have, a beer and wine license. If you want a drink with your dinner, you can’t get it here, but you could go into the nice Irish pub next door to start things off. Liquor license or not, the place is packed tonight and we are lucky to get a table. Taken after the crowds had gone home. It was packed when we got there. We have guest stars on tonight’s date, Stacey and her husband Steve, so we will have a lot of pictures of our food. We haven’t seen Stacey in almost 20 years and how we got together is too long a story to share here. Speaking of sharing, we order two appetizers to share. Sandy Springs Rolls in Sandy Springs. First up is the Sandy Springs roll, which has cabbage, carrots and onions. 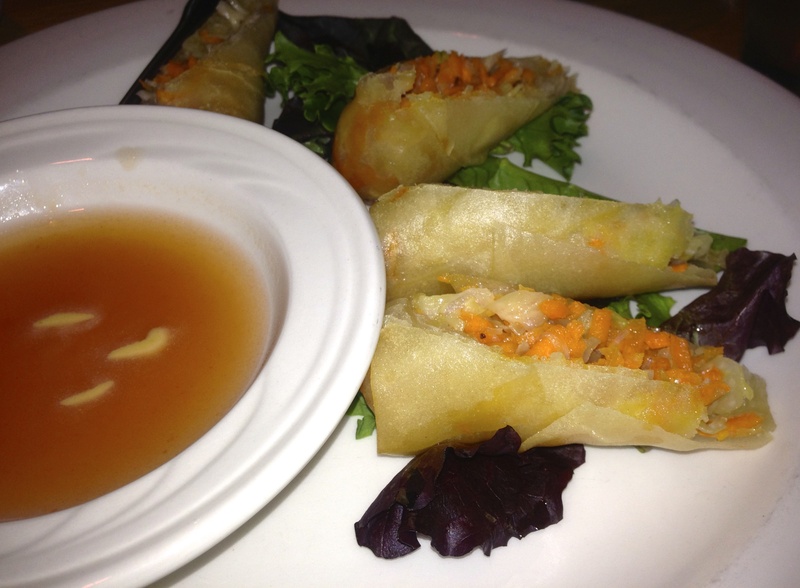 Most spring rolls are vegetarian anyway, and this dish is delicious. Looks like a potato pancake, but it’s not. 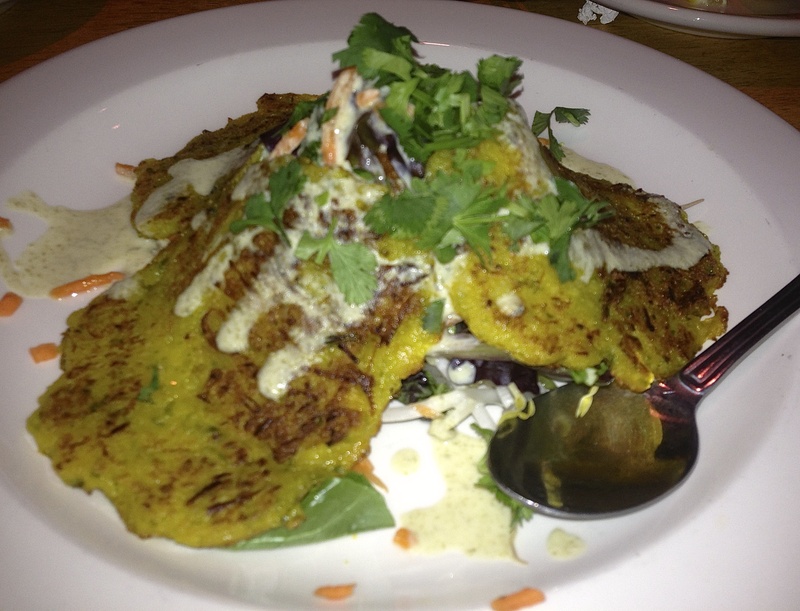 Our other appetizer is the spaghetti squash cakes. They’ve got polenta and leeks in there as well and taste just like your grandmother’s potato pancakes, if your grandmother made potato pancakes. 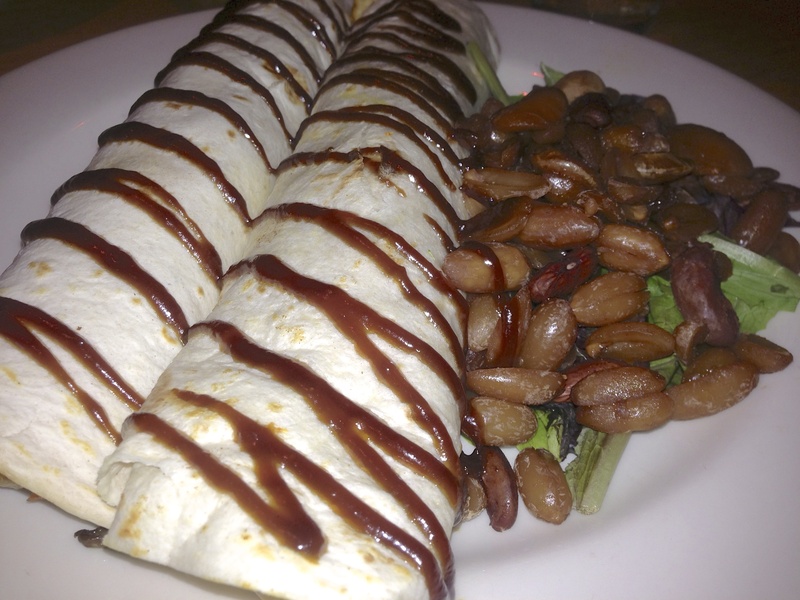 We are two for two in delicious dishes. Ah, if only we had a beer to go with this dinner. The person who decided not to get a beer license here must be the same person who is in charge of the parking situation at Heirloom Market BBQ that we reviewed last week! It’s time to order our main courses. Eve orders the Moo Shu Vegetable entree, which is two HUGE tortillas filled with tofu, bean sprouts, cabbage, carrots and mushrooms. This dish could feed four people. It’s also the best tofu dish this reporter has ever had. It’s so good that our solo offspring devoured the leftovers the next day, and he rarely comes within 10 feet of tofu. This is a must-order if you go here. 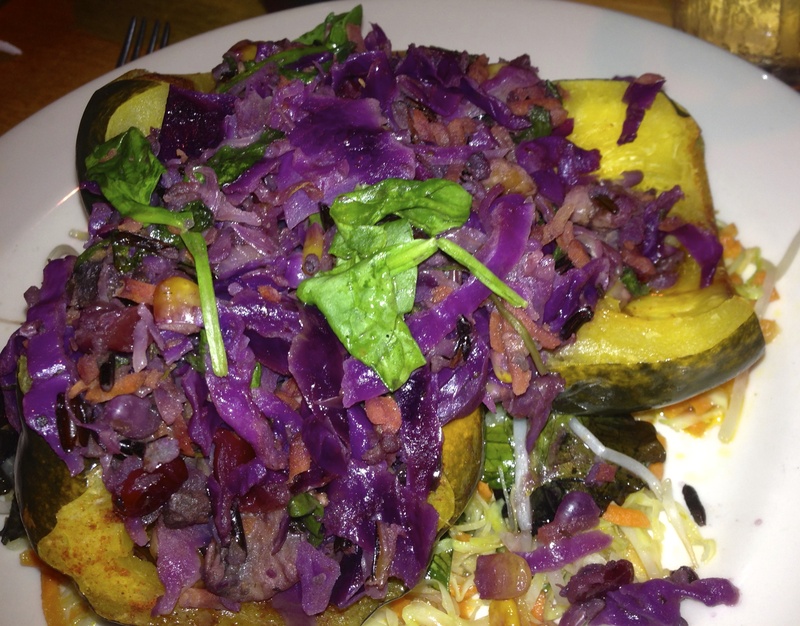 I order the Stuffed Acorn Squash. A big order of acorn squash. Again, this is a huge portion and half of it goes home. It’s got beans, corn, mushrooms, carrots and rice in there along with some other goodies. It’s good, but not as good as that moo shu dish. It is an excellent lunch the next day. Stacey and Steve get two entrees as well. 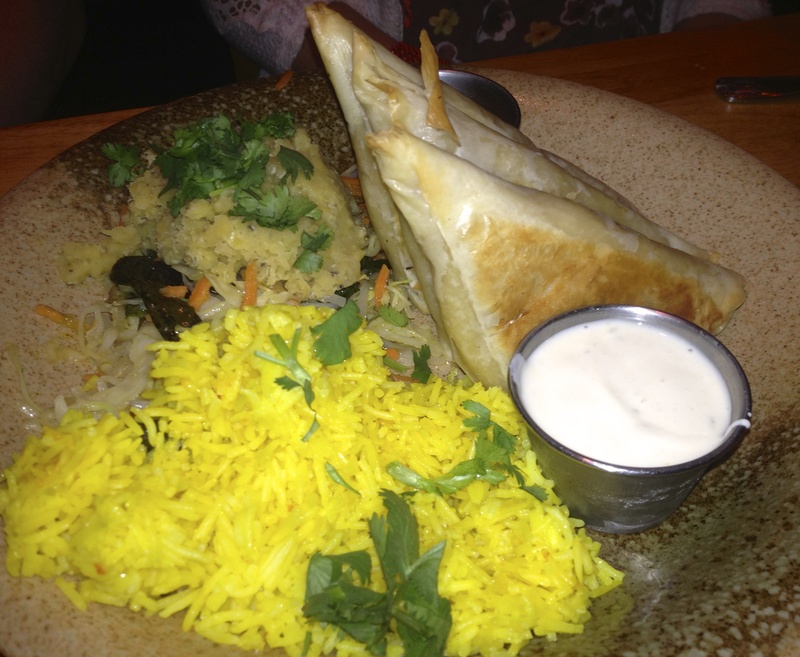 The Baked Samosas are full of curried potato and peas. You get some lentils and saffron rice with this dish as sides. Doesn’t the stir fry look healthy? It must be because it has tofu, broccoli, snow peas, mushrooms and squash in it. There’s brown rice underneath and a soy-ginger sauce on top.